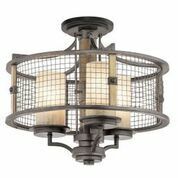 The Elstead Lighting Ahrendale Medium Ceiling Light Is In A Dressed Up Rustic Style, Opening New Possibilities Sure To Enhance Your Decor. 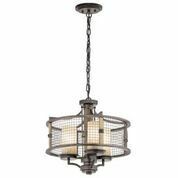 The Ahrendale 3 Light Ceiling Pendant By Kichler Lighting Features Open Anvil Iron Mesh That Surrounds And Protects Vetro Mica Shades Which In Turn Casts A Satisfying And Comforting Illumination In your Home. The Elstead Ahrendale 3 Light Ceiling Pendant Can Be Converted To A Semi-Flush Ceiling Light If Required, To Accommodate Lower Ceiling Heights.